I have a had a number of questions about Open BIM and the IFC file format. In this blog I want to try and explain a little about IFC. As this is a blog it is only a brief overview of a huge subject. IFC is a file format that is independent from any one BIM authoring program such as Revit, Aecosym, ArchiCAD, Tekla etc. It stands for Industry Foundation classes. The format is developed by a non profit organisation called BuildingSmart . Without getting too technical. It is an XML specification which is implemented by the software vendors into their software. Some do it better than others which we will talk about later. Don’t edit the IFC file in a text editor unless you really know what you are doing. IFC is very important because a BIM project cannot be done in one software. We need a way of exchanging graphics & data from one software to another. The information in a model is often forgotten about but is essential to the success of the BIM process. It may not be important for your clash detection but it is important to other members of the BIM team such as the contractor, QS, FM manager and others. Majority of BIM authoring software’s support IFC. IFC is constantly under development and constantly improving so you have to ensure you are using the latest update of your software’s IFC importer/exporter. 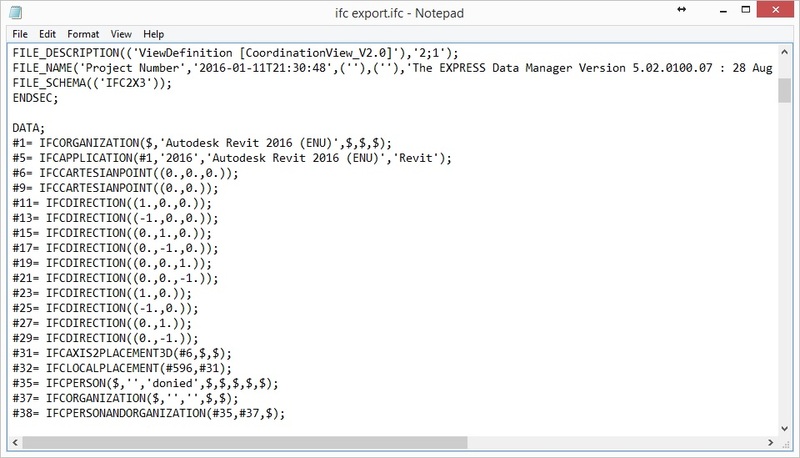 This IFC export update also gives you an alternative interface to the standard Revit IFC interface. IFC is only as good as the software that exports it and the software that imports it. What I mean by this is that IFC is only a specification. Each software company will implement IFC differently to suit the objects in their software. Some better then others. For example in previous versions of Revit, Wall profiles didn’t export very well. Autodesk have improved their implementation of IFC over the last few versions and now the wall profiles export correctly. Don’t round trip your IFC exports. 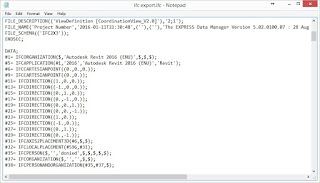 Don’t export out of one program such as Revit and then import it back into Revit again. Every IFC exported object is given an IfcGUID. This is a global unique identifier assigned to every object. This IfcGUID will live with the object so each time it is exported the object will always have the same IfcGUID unless you delete the object and redraw another object in it’s same place. How do I know if it is an export or an import problem? I often use a program called XBim http://www.xbim.net/ XBim is an independent IFC viewer. If it looks ok in XBim then it’s not an export problem it’s most probably an import problem. If you are using IFC on your project ensure that the IFC guidelines are clearly laid out in the BIM execution plan. Ensure everybody is using the same version. You may encounter problems using IFC between different programs. But there is nothing new about that. There has always been issues going between different programs. When you encounter problems exporting/importing find out where the problem is and address it by learning more about IFC and find a workaround. If you have any questions on anything in this blog or any other blog please feel free to contact me at dan@siscin.ie.